Best Beach In Seminyak - The island of Bali is a prima donna of Indonesia's most visited tourism by foreign tourists and domestic tourists. Besides famous for its natural beauty and culture, Bali is also known to have beautiful beaches and stunning world-class to enjoy one of which is Enjoying the Beauty of Seminyak Beach On Bali Island which is the Best Beach In Seminyak. Seminyak Beach or Dhyanapura Beach is one of the Most Beautiful Beaches on the Island of Bali that you must visit while on vacation to the island of Bali. The beach is located in the area of Seminyak Village, Kuta District, Badung Regency, Bali Province, Indonesia has beautiful and exotic beaches with soft white sand, gentle beach contours and crystal clear sea water. 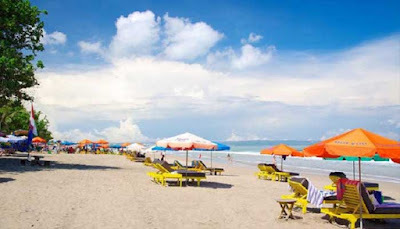 Besides having beautiful scenery, Seminyak Beach has also been equipped with international standard facilities such as a restaurant, hotel, villa, pub or cafe so that many foreign and domestic tourists who come to visit to enjoy the beauty of the beach with a sense of comfort, calm and comforted. Seminyak Beach is located north of Kuta Beach. Atsmofernya almost the same as the one in Kuta Beach. However, because of its location a little far from the center of the crowd, Visitors at the Beach Seminyak not as much as the existing visitors at Kuta Beach. This quiet atmosphere makes you able to Enjoy the Beauty of Seminyak Beach with a comfortable and quiet. The area around Seminyak Beach was originally an agrarian village. Although the location is near the beach, the majority of the population work as farmers. But after Kuta Beach to fix itself into the Favorite Places in Bali, the surrounding area also participate to improve themselves are no exception with residents in Seminyak Beach. The residents then turned the profession into a provider of lodging services, food and other facilities for the tourists who come to visit Seminyak Beach. Besides Enjoying the Beauty of Seminyak Beach, In this place, you can also do shopping, fine dining, SPA, and nightlife because Seminyak Beach is the center of High-End boutique, upscale restaurant and also SPA. Because of its location adjacent to Kuta Beach and has a resemblance to Kuta Beach, the activities that can be done in Seminyak Beach are also similar to what you can do in Kuta Beach such as swimming, sunbathing, relaxing, surfing, beach volleyball or waiting for Sunset to come twilight day when sunset twilight paint beautifully above the horizon of the sky of Seminyak Beach is like a natural painting that is very beautiful and amazing for you to enjoy. Seminyak Beach is not as crowded compared to Kuta Beach. 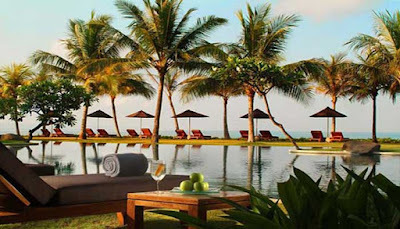 The tourists also prefer Seminyak Beach as they have more private accommodation, shopping places that offer unique items, luxury SPA treatments, and international standard restaurant. Seminyak is an Elite Tourist Place on the Island of Bali that attracts many foreign tourists and domestic tourists. By using Traditional Balinese Massage method, Making many place SPA in Seminyak hunted by the tourists. While for you who like shopping, Seminyak is the perfect place for Shopping Tour In Bali Island. The boutiques around Seminyak Beach sell a lot of clothes made by some famous designers. You can find it in Seminyak Square located on Kayu Ana street. In addition, Seminyak Beach area is also famous for the number of Luxury Private Villa for rent with a variety of luxury facilities on offer. Enjoying The Beauty Of Seminyak Beach In Bali Island is the dream of many tourists as the Most Favorite Vacation Place on the Island of Bali. If you're interested, plan your holiday this year with friends, friends or family to Seminyak Beach, Bali Island.